After winning our first game in the hockey tournament on Friday, today was the day to show our mettle. The objective was clear. Win both games and we'd make the finals. Lose even one of them and so long farewell. With the lure of more eating if we did make it to the Sunday final game, my goal was clear. Win! The first game today was relatively easy as we won 5-1. After a short break, we went into our second game of the day. Nothing better than putting on wet equipment... Well, at least its our own sweat. I guess we were a bit too happy with ourselves as we started the game since we were down 2-0 by the 3 minute mark. I guess my mind was elsewhere (guess where it was?). 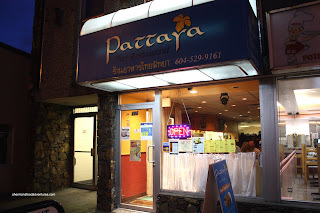 We had already made reservations at Pattaya Thai the night before as we walked past it after we finished up at King Sushi. My mind was wandering... However, we re-focused and ended up coming back to win 4-2. Woohoo! We made the finals! More importantly, we'd eat again tomorrow!!! Woohoo! Odd as it may be, Kim joined us for dinner tonight. No, he's not part of our team. In fact, he doesn't even play hockey. But it was on our "to try" list and I thought that it would be a good oppo rtunity for him to experience it with us. The rest of "us" were Gadget Girl, Mr. Blueberry, Boss Woman, Emilicious, Milhouse and Lionel Hutz. 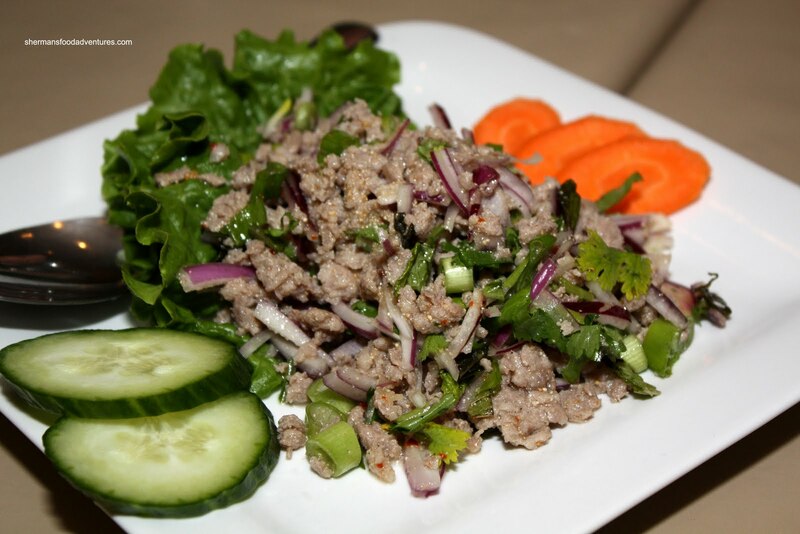 We started with the Larb Moo, which is a salad consisting of minced pork, onions, mint, roasted rice powder and lime juice. This was a relatively decent dish. Only thing I would have like to see was a bit more lime. Since Pattaya Thai is famous for their Prawn & Crab Rolls, we were obliged to order them. We actually got 2 orders since there are only 4 rolls per dish. They are famous because Vancouver Magazine named it the #1 food item in the GVRD for their Best Things to Eat and Drink edition. That is indeed a bold statement. This is where it gets interesting. We had 8 people at the table and none of them thought it deserved that distinction. However, I personally didn't mind it. In terms of being a spring roll, it was pretty solid. Crunchy, non-oily exterior and crisp veggies on the inside. Not really sure about the cream cheese though. I thought it hid what little crab there was. 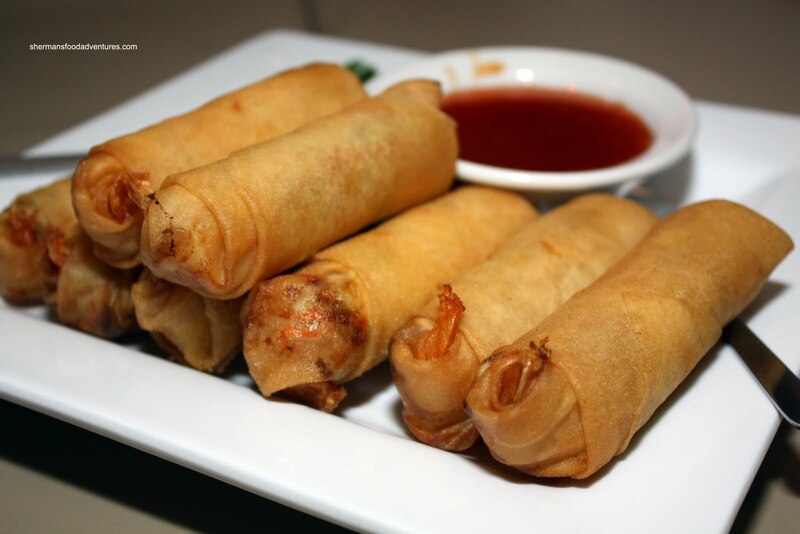 For $9.99, there really needs to be more crab and prawn in these spring rolls. Definitely not #1 in my books, especially in the GVRD. Now while I was okay with it, Gadget Girl and Emilicious really didn 't care for it. The combination of cream cheese and other ingredients didn't work for them. Next up was the Pad Gra Prao which, in this case, was chicken with garlic, onions, Thai chilis and sweet basil. I'm guessing that the dish was on the bland side due to us asking for everything to be mild (not everyone can stand the heat at the table). Thus, it's a bit difficult to assess the "real" flavour of any dish really. However, many people do choose mild, so it's not a stretch. If we look at the individual components, the veggies were still crisp and the chicken was not overcooked (sauce was slightly sweet with some basil aromatics). 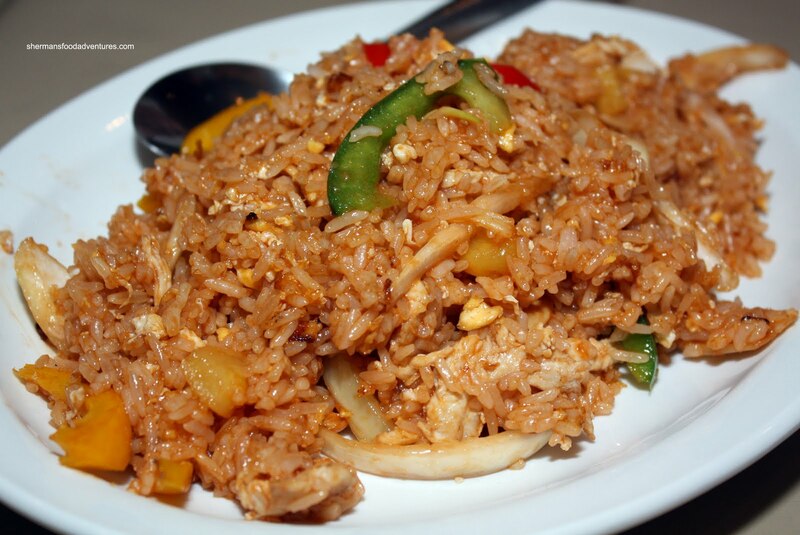 As for the Pineapple Fried Rice, it was curiously thick. Was it the egg? Was it too much sauce? The texture was a little off in terms of fried rice since it was soggy. Tastewise, it was predominantly sweet with extremely minor hints of fish sauce and chilis. Despite this, I didn't mind eating it for some reason or another. We were really hungry from our 2 games, maybe increase hunger results in lessen expectations? We ended up with 2 curries with the first being the Chick en Green Curry. Once again, for a mild curry, it was decent. 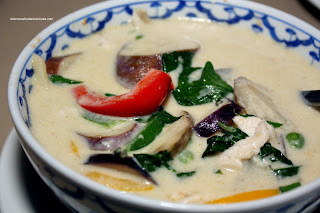 Within the coconut curry, there were nice pieces of eggplant, peppers, peas and basil. What was missing was the chicken. Well, there was chicken, just not a whole lot of it. The Beef Red Curry suffered from the same problem. Plenty of bamboo shoots, basil and peppers. Not much in the way of beef (which was decently tender). It's too bad that it was not spicier, which is our own fault. Had it been, it would've been much more flavourful. Rather, it became a smooth coconut curry once again. 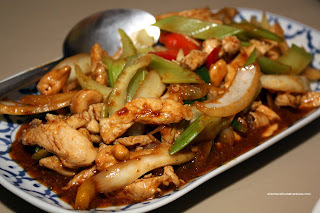 Strategically, I think we made a mistake when we ordered both the pad gra prao and the Pad Cashew Nuts. They were quite similar. Other than a slightly darker sauce (probably due to more oyster sauce), it tasted practically the same as the pad gra prao, except with cashew nuts. Hey, don't get me wrong here, it wasn't bad. Definitely pleasant to eat again with crisp veggies and slightly dry chicken. 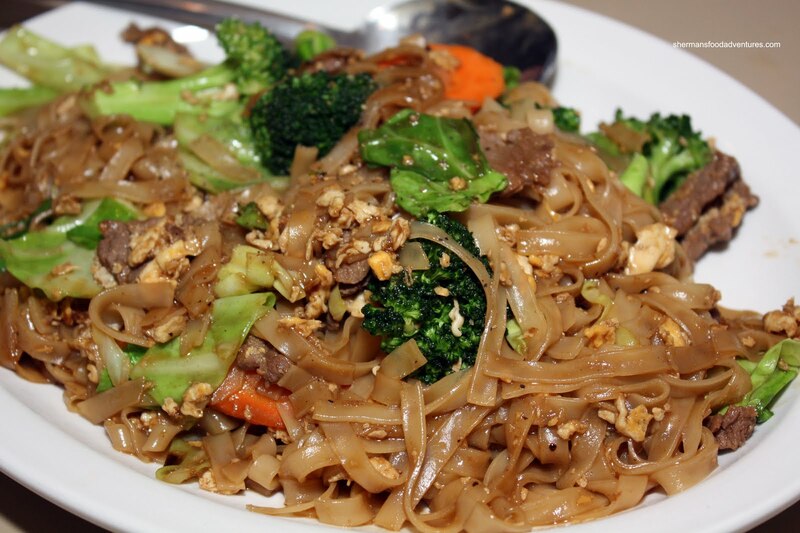 In another episode of "a dish that everyone orders" is the Pad Thai. Yes, I know it's over-represented as a Thai dish; but we all like and ended up ordered 2 plates of it. As you can see, it is a decent portion with nice big shrimp. However, to me, it was bordering on the bland side. Despite the colour, it wasn't afflicted with the "ketchup" sauce problem. Rather, it looked more flavourful that it turned out to be. Not terrible in any stretch of the imagination, it just need a bit more flavour. 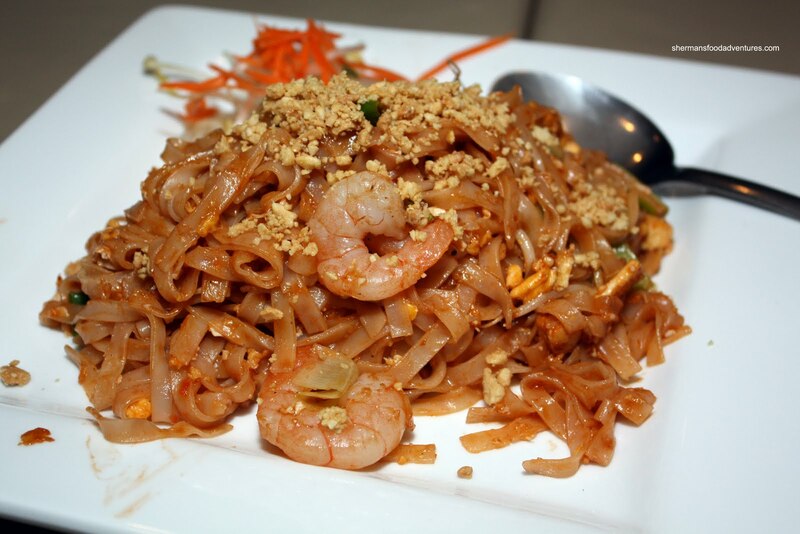 Where the pad Thai was lacking in flavour, the Pad See-iew definitely didn't have that problem. Well-seasoned with soy sauce, this was a well-executed dish. Noodles were still a bit chewy while mixed well with crisp broccoli, carrots and cabbage. This was probably my favourite dish of the meal. Several people concurred with that sentiment. Our last dish for the meal was the Garlic Pork and I kinda liked it as well. 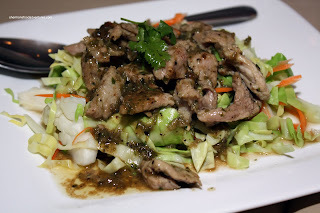 The pork was tender and cooked nicely with a sauce consisting of garlic and black pepper resting on a bed of cabbage and carrots. The flavourful sauce went well with a bite consisting of both a piece of pork and some veggies. If we look at the meal as a whole, it was actually alright. If we had requested spicy, I'm sure the food would've had more pop. With that being said, it was sorely lacking flavour despite this. Now if we focus purely on the spring rolls, I'm a bit torn. I really didn't mind them; but for the price, it's not worth it. If this is the claim to fame according to Vancouver Magazine, there is a certain level of expectations. I expected crab and prawn in the spring roll, as per the description. But honestly, there was not much of that at all, especially at $2.50 each. For others at the table, they just plain didn't like it, period. And you really can't argue with 8 individuals with different tastes who actually agreed on one thing. Yah, exactly. 8 out of 8 people dining (with different personal tastes) sharing essentially the same opinion is a relatively decent gauge of a particular item. However, I'm sure with everything, some people love this spring roll. Fair enough, but we're not disputing what other people like. We're only forming an opinion that it is hardly the top item in town. It's funny about critics, and their picks. That list in Van Mag has some good dishes, but it's like movie reviews, I often disagree with them. This still looks like a solid thai meal! I m forever in search of a flavorful pad thai, green curry and solid coconut rice! Mare-bear, I agree, there was nothing inherently offensive about the food and I thought the portions to be very good. So it was a decent meal. It's really too bad they got saddled with the distinction of having the #1 item to eat in Vanmag. It creates all sorts of unrealistic expectations. Thanks for checking this place out, Sherman. Your perspective is always valued, as is Kim's. It would be interesting to hear from old Randall! I'll bet he'd think there's some sort of blogger conspiracy going on! Jenny, taste is very personal and I'm sure the cream cheese appeals to some people. I guess some people at our table didn't like it. 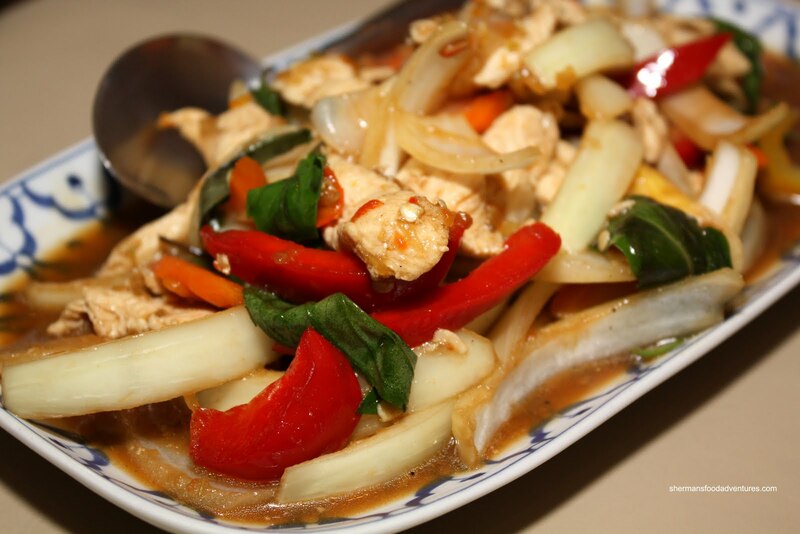 The food looks great...I have an extreme craving for Thai food now! Nice pics by the way. Thanks! The food does look good eh? Yah, it wasn't bad, but it really needed more flavour. 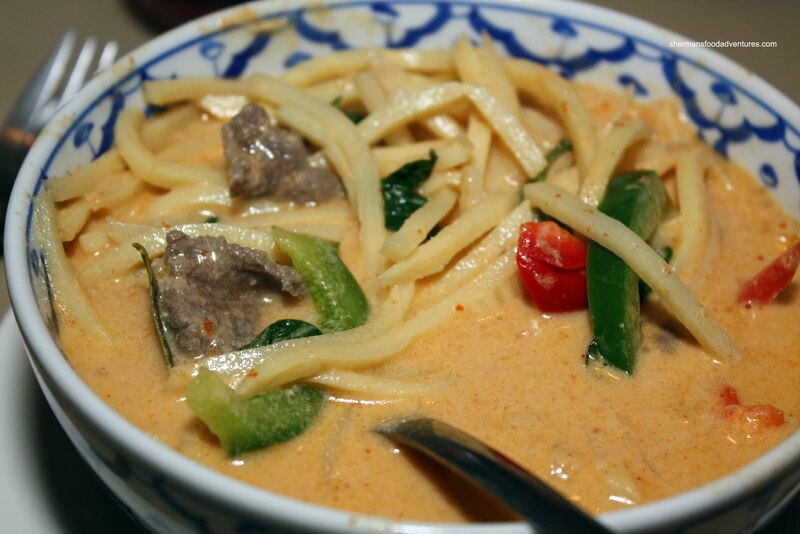 Yeah, does look pretty good...I might just need to settle for some Thai Express for now...haha. Well Sherman...thanks to your post..believe it or not, I just went over to a Thai Express and ordered a Pad Thai!!! And yes, I'll put it up on my food blog...eventually. That's hilarious! I had influence over your dinner choice! It was actually pretty good. I enjoyed it and I thought they gave a fair portion for the price. Would definitely return again. Might try the Pad Sew next time.